Okay, maybe it's just me, but isn't there something peculiar about this People video? Wow! 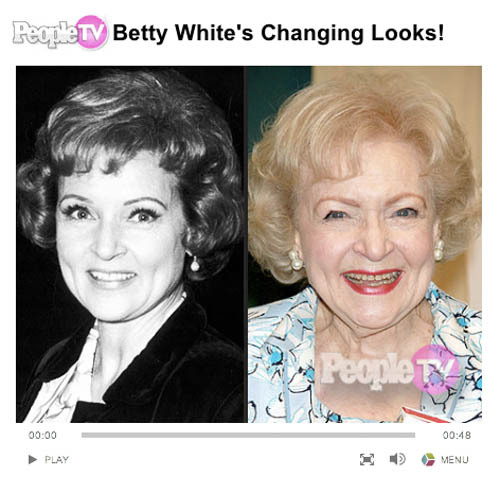 It's almost as if she aged, or something! Perhaps the video shows her astonishing, kaleidoscopic makeovers in a dazzling parade that makes Lady Gaga look like Tom Wolfe, but from the frame they use to illustrate the point, she not only looks the same, it's possible she's wearing the same blouse. WARNING: it's just a screen shot. Not the actual video. Don't click on it and get angry because nothing happens. 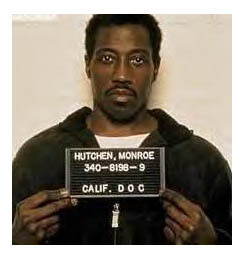 Wesley Snipes won't be leaving home with his American Express card anytime soon -- primarily because he's currently sitting in the slammer -- and that's probably a good thing. "Blade" star Snipes was slapped with a lawsuit in Orange County, Fla., Circuit Court on Friday by American Express, which claims that the actor racked up a $29,343 bill with them when he was still walking free. The complaint is seeking that amount, plus interest, attorney fees and court costs. That should be easy to prove. Mr. Snipes, is this your signature on the charge slip? Yes. And you’re not paying this $968 dinner tab . . . because? Because the restaurant has no authority over me, according to a little-known provision in the Constitution that prohibits tavern owners from seizing the property of another person across state lines without a writ from the posse comitatus. Uh huh. And why are you currently in jail? A difference of opinion over my interpretation of the Constitution. Uh huh. So, when you used your card to pay for these things, did you intend to pay? I invoke my Fifth Amendment right against self-incrimination. Bottom line? They’ll be lucky to see half of it. Unless there’s a Blade 4, but the government probably has dibs on future earnings.